The holidays are over, and there are days in this crazy world that we want nothing more than to curl up with a good book and a cup of coffee and stay home....there are days that we just need to avoid all the people. We have the perfect uniform for those kind of days. 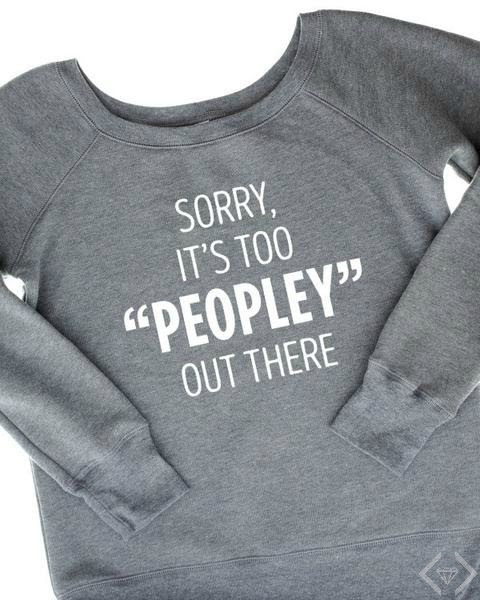 This "Sorry, It's Too 'Peopley' Out There" slouchy tee and sweatshirt will keep you comfy and cute, all while letting everyone know just how you feel about the busy world outside. With 3 colors in the tees and sizes S - 2X, you're probably going to want to get a couple. We want to know...just how often will you be sporting yours? Too Peopley Tee & Sweatshirt for $15 Off use code PEOPLE2 and it will take $15 OFF, with FREE SHIPPING. That makes the tee just $17.95 and the sweatshirt $29.95...(and Hint: that is the lowest price ever!) The code is valid 1/25 through 1/31.